AMES, Iowa--(BUSINESS WIRE)--Jul. 2, 2018-- NewLink Genetics Corporation (NASDAQ:NLNK), reported that updated Phase 1 data evaluating indoximod plus front-line radiation and maintenance chemotherapy for the treatment of pediatric patients with newly diagnosed diffuse intrinsic pontine glioma (DIPG) were presented Sunday, July 1, at the International Symposium of Pediatric Neuro-Oncology (ISPNO) 2018 Annual Meeting in Denver. 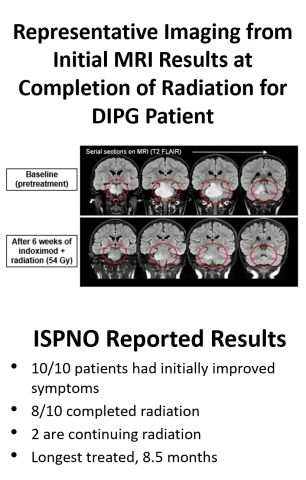 Data were presented on ten newly diagnosed DIPG patients, all of whom had initiated therapy at the time of this assessment. All (10/10) demonstrated initial symptomatic improvement. Eight of ten had completed radiation, with the remaining 2 of 10 patients continuing radiotherapy. While a subset of the patient cohort developed inflammatory and other adverse symptomology, a common occurrence in this patient population, these symptoms were actively managed. Currently, 9/10 patients remain on study, with the longest time on study of 8.5 months. These data include more mature follow-up on the 6 patients previously presented at AACR 2018. This DIPG cohort is a subset of NLG2105, a Phase 1 study evaluating indoximod, NewLink’s IDO pathway inhibitor, in combination with radiation and chemotherapy for pediatric patients with malignant brain tumors. The DIPG cohort has been expanded from an initial pilot study based on early safety and efficacy data and is currently enrolling with a target of 30 DIPG patients.